Farmer crash "hurt the bike more than me"
Rapid Solicitors Kawasaki’s Keith Farmer remains positive after a weekend of mixed fortunes in the Hampshire countryside. The Northern Irishman crashed on lap 8 into the first race. After exiting the club chicane with less turn on the bike than is needed, Farmer struck the grass along the start/finish ‘curve’, sending him at high speeds into the barriers, thankfully relatively unscathed; though the safety car was sent out to give RaceSafe a chance to clear up the debris. Prior to the incident, last year’s STK1000 champion set the second fastest lap of the race, placing him 2nd on the grid for the second outing, beside his triple time BSB champion team mate, Shane Byrne. Farmer actually led the race briefly, the first time he’s done so in the top class, but fell back to 6th at the time of the red flag, on lap 13. Speaking to PaddockChatter after Race 2, the Irishman said: “The crash hurt a bit, not massively, it hurt the bike more than me. Though my hand and my left foot were a bit painful. Other than that I’m not complaining about it, I didn’t really feel it during the second race. The second race was a bit stop and go, what with all the safety cars. I think we were hit with a faulty tyre. We took the out lap on a tyre from the warm up this morning, and then we put in a new tyre on the grid. Then when we had done our first warm up lap, I realised we had chatter. So I had to deal with that the whole race. We learnt our lesson, to just run a new tyre on the out lap from now on. Apart from that, it wasn’t too bad, it’s left us with gaining a position in the championship, again still, with a DNF. We’re up to (joint) seventh in the championship, only a point behind sixth. It’s been a long and frustrating weekend, what with not much track time. 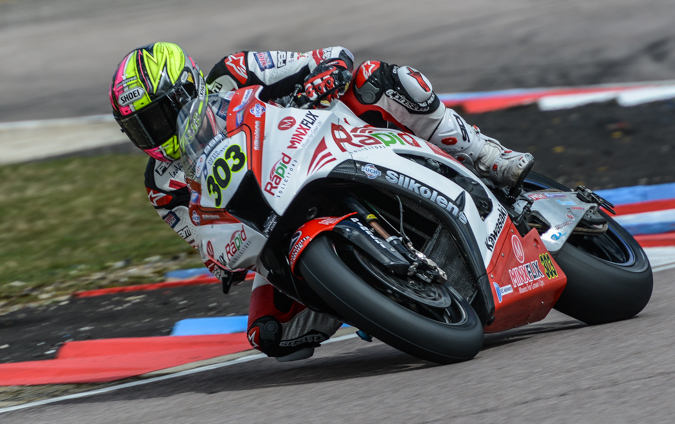 Next Next post: Arm pump an issue for Jacobsen in race one at Thruxton, race two "unlucky"